Get ready to experience and drive some of the hottest muscle cars AMG has ever made, all from the comfort of your own home. DriveClub is coming soon to PlayStation 4 and it’s bringing a choice selection of AMG high-performance cars for your racing pleasure. The stable of Mercedes-AMG cars is impressive and it will include five high-performance AMG cars. It will feature the new 2014 A 45 AMG, CLA 45 AMG, the C63 AMG Coupe Black Series, the SL 65 AMG, and the SLS AMG Coupe Black Series. In a brilliant marketing move, Mercedes-Benz is introducing their new cars to the young and modern Millennial generation through “gaming.” The German automaker first introduced the new DriveClub racing game to the European public at gamescom in Cologne, Germany last month. Mercedes knows how to market their vehicles well and are introducing five high-performance AMG cars to a new generation of buyers through PlayStation 4. Mercedes will use a medium that is experiencing vast growth in the area of smartphones, tablets and game consoles like the new PlayStation 4. DriveClub will bring to life the incredible performance of the AMG cars with an authentic and immersive driving experience. The new DriveClub will let gamers experience the exhilaration of racing with the most powerful and beautifully designed Mercedes-AMG cars in the world. Mercedes says the audiovisual quality of the cars and the tracks is “staggering”, and the view from the cockpit is “absolutely true to life,” as you will see in the video below. Gamers can share in the thrill and excitement of high-speed solo racing, or join a racing club to connect with friends. DriveClub allows gamers to share experiences, send and receive challenges, and keep up to speed with their team’s performance. The new PlayStation 4 release date is set for November 15, 2013 here in the U.S. The new system focuses on the gamers and is supposed to provide “powerful graphics and speed, intelligent personalization, deeply integrated social capabilities, and innovative second-screen features.” It’s almost here, so have a first look at the new 2014 A 45 AMG, CLA 45 AMG, the C63 AMG Coupe Black Series, the SL 65 AMG, and the SLS AMG Coupe Black Series in this trailer. 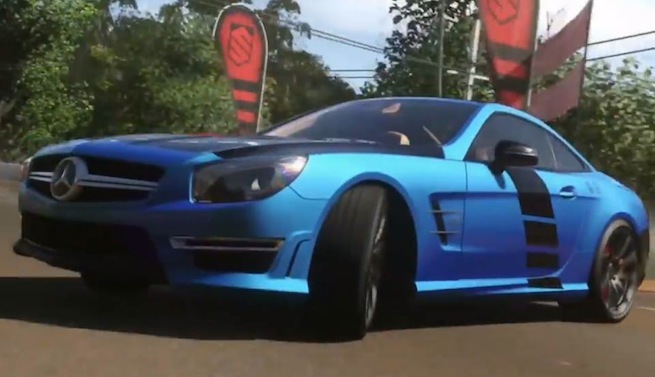 Watch the new DRIVECLUB trailer video.